PERFECT SIZE FOR SMALL TRASH CANS: 4 gallon trash bags fit most bathroom/bedroom trash cans and office/coffee bar waste bin, car or garage trash cans. Our small trash bags are thicker and stronger than store, reasonably price! USE AS PET LITTER BAGS: Customer comment that bought these after grocery stores stopping giving the old plastic bags, which I used to use as small trash can liners and for scooping kitty litter box surprises into. Its a pretty blue color and very strong. Will continue to buy when it is time to resupply. GOOD QUALITY: Strong and sturdy to avoid messy trash disasters as you transport it. Small garbage bags are made of the pure PE with no smell, use environment friendly materials, minimize pollution a lot, and the earth will thank you for all your love. CUSTOMER SERVICE: 100% quality assurance, not satisfied with a full refund. Not a heavy duty trash bag, but is durable enough for light trash. 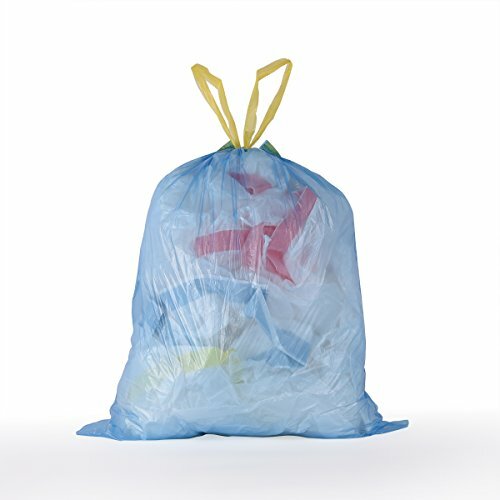 Why choose our garbage bags? Very convenient and easy to enjoy your kitchen life. When cleaning up the garbage, do not worry that the hands will be covered with garbage.